Lissenung Island Resort - Best little island resort in the Pacific! The best little island resort in the South Pacific! Picture a small, private, tropical island with a white sandy beach, tall palm trees, magnificent sunsets & traditional bungalows, surrounded by some of the worldâ€™s best coral reefs. The four bungalows are built with tradtional building materials in order to blend in and be eco friendly. They are spread out over the island, ensuring maximum privacy for our guests. 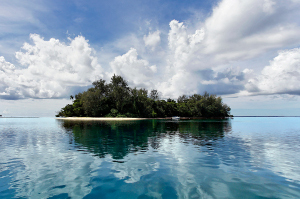 Lissenung Island Resort has it all: Pelagic fish action, currents, wall and muck diving, wrecks and beautiful reefs. Free shore diving on our house reef with morning boat dives! Seven awesome surf breaks, only 10 – 20 minutes minutes from Lissenung Island. No restrictions, no timetables – just get out there and surf! © lissenungisland.com, last updated 3 March 2014.